Big impressions last. Make sure the mail you send out does that every time with metallic postcard printing. From small businesses and creative agencies to corporations, postcard printing can make a big impact on your bottom line. come in a wide range of sizes – from 4”x 6” to 6” x 11”. uses 16 pt. heavyweight cardstock gloss. can be printed in 1 or both sides. have a spot UV option gives added visual interest to your prints and better wear and tear. can have rounded corners to create a unique shape. When black or colored ink just won’t cut it, go with metallic. Our metallic postcard printing goes through the cold foil printing process. Silver foil is glued on paper, then colored ink is printed on top of it. The result is a metallic finish that gives off a nice sheen. The Standards. Gold, silver and bronze are the most common metallic colors. These are popular picks for weddings or invitations because of its elegant and classy look. A Spectrum of Colors. You can take any CMYK color you want and turn it into a metallic finish for a fun and vibrant feel. Explore vivid colors to create interesting designs so your recipient will want to pick up your postcards. Promote Your Events. Metallic printing postcards have a built-in sparkle to it. Use that to entice potential customers to come to your events. Use metallic colors to highlight your event details and the perks of attending. They’ll have a hard time thinking of a reason not to go. Hype Up your Promos and Sales. Create more buzz for your upcoming promotions or a one time sale. Mail postcards or hand them out to old and new customers to spread the word. Think Out of the Box. Use postcards as party invitations, discount flyer, or business cards and create more impact. These unconventional uses means your recipients will never forget your name and your message. Consistency is key. Create a uniform look by using the same paper and design as your business card, letterhead, and other marketing tools that show what your company is all about. Highlight your CTA. Metallic postcard printing is a great marketing tool. Use this unique finish to direct your reader to your call-to-actions. The sparkly sheen ensures your reader won’t miss out on the important stuff. Engage your recipient. Include special offers or coupons in your postcards that creates interest and boosts sales too. It’s in the details. 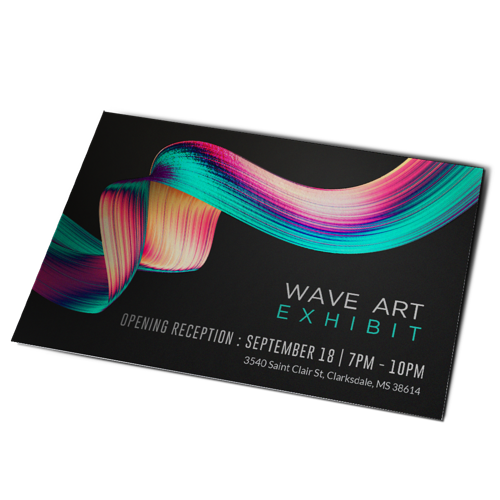 Put more interest to your postcard design by adding spot UV coating in our artwork. Make your postcards unique by choosing rounded corners instead. These small details make your mail stand out more. Use our downloadable templates to start customizing your own metallic postcards. Print postcards with us and upload your file on our site. Make sure to select our free PDF proof option to check your file for errors before we start the printing process. How long will my postcards take to get to me? Your “printing turnaround” is the number of days needed to produce your order. This does not include holidays and weekends. Add your printing turnaround time to your preferred delivery date and this is the date you can expect your postcards to arrive. Spot UV is a high gloss layer that is added to the entire postcard or selected area, depending on your design. This clear gloss UV coating creates highlights, contrast and dimension to your artwork. This stands for Cyan, Magenta, Yellow and Black (K) which are the key colors used in the printing world. When you setup your postcard artwork for printing, make sure it is in CMYK. Converting from RGB can cause conversion issues and distortions,so your colors might not show correctly.